And experts say cutting down on single-use plastic may be more about changing habits than changing laws. Seattle, Miami Beach, Oakland and more than a dozen other cities, about half of them in California, have either banned plastic straws altogether or required customers who want a straw to ask for it. New York City is also considering a ban. The bans are not frivolous, as plastic has been found in fish, in the bellies of seabirds and in fresh drinking water as well. A viral video of scientists removing a straw from a sea turtle’s nostril has inflamed passions too. But at least one expert in the field of “marine plastic” suggests plastic-straw bans may not make much of a dent in the problem. Straws are an easy target for environmental change, though, because they’re considered nonessential. Kara Lavender Law, a research professor of oceanography at the Sea Education Association in Woods Hole, Massachusetts, said there’s plenty of evidence that throwaway plastics are getting into the ocean, as cleanup efforts find lots of straws, bottles, bags and food wrappers. The world’s largest accumulation of trash, dubbed the “Great Pacific Garbage Patch,” is now more than 600,000 square miles, according to a study in the journal Nature. Law and several others wrote a 2017 research paper on plastics for the journal Science Advances, estimating that since the 1960s when consumer plastics started being widely used, approximately 6,300 million metric tons of plastic waste has been generated worldwide. Only 9 percent of that has been recycled, 12 percent incinerated, and the rest of it dumped in landfills or directly into the environment. Hawaii seemed like a logical target for plastic-straw bans this year. The state depends on beaches and tourism and touts its pristine coasts, hardly a place where anyone would want to see discarded straws scattered about. 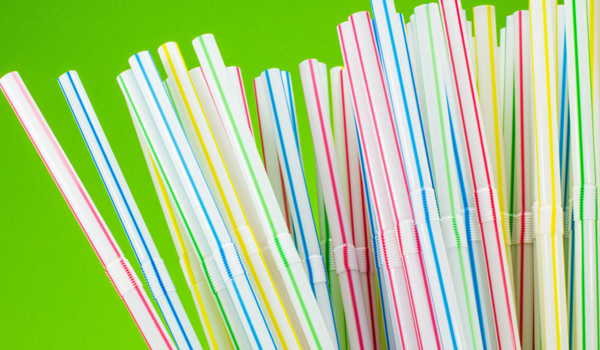 A bill to ban distribution and sale of plastic straws was introduced in January by state Sen. Mike Gabbard, a Democrat, and the legislation sailed through the Agriculture and Environment Committee, which he chairs. It failed to clear the Judiciary and Ways and Means committees, where it was cross-referred. Objections came from the Hawaii Food Industry Association, the Hawaii Restaurant Association, the Retail Merchants Association and the American Chemistry Council, all of which presented testimony in hearings about the bill. Environmental groups such as StrawFree, a Southern California group that is pushing reusable straws made from bamboo, say yes. They note that reusable water bottles are becoming a popular alternative to plastic and suggest that reusable utensils could become popular as well. The American Chemistry Council also opposes plastic-straw bans and recently suggested that an “opt-in” plan, under which diners must ask for a straw, is a better solution. McDonald’s uses 95 million straws a day in the United States, according to the watchdog group. In opposing the proposal, McDonald’s said it continues to look for “sustainable alternatives for plastic straws globally.” In fact, it is phasing in paper straws in the United Kingdom after the U.K. banned plastic straws. The New York City plastic-straw ban bill, introduced by Democratic Councilman Rafael Espinal of Brooklyn, had its first hearing this month, picking up support from Democratic Mayor Bill de Blasio’s administration. In an op-ed for the New York Daily News, Espinal and colleagues noted that at least 65 restaurants in the city have signed on to a campaign to do away with plastic straws. Many disability advocates oppose straw bans, noting that alternatives such as paper straws and reusable straws may not work as well for disabled people. Jessica Denise Grono, of Phoenixville, Pennsylvania, who has cerebral palsy and who blogs as “CP Mommy,” said in an email interview that without a straw, “I’d be forced to have someone pour a drink in my mouth. Only half would go in. A straw gives me a less messy and independent way to drink.” She said she’s not opposed to the opt-in proposals. In California, the opt-in already has become the fallback position for advocates of a statewide plastic-straw ban. Unlike some of the city ordinances, the bill in the Legislature would provide for straws only on request in sit-down restaurants. It would not apply to takeout-only restaurants, meaning those eateries could continue to hand out straws to all customers. The bill passed the Assembly in May and was headed for the Senate. It follows in the wake of California banning plastic retail bags in 2014, which was upheld by statewide referendum in 2016. “I’m not trying to get rid of plastic straws,” insisted Majority Leader Ian Calderon, a Democrat and sponsor of the bill who said he grew up surfing in the Pacific and saw plastic debris there every day. But Assemblyman Matthew Harper, a Republican from Orange County, said Calderon’s bill is a smokescreen to eventually “have an outright ban of plastic straws.” He objects to the bill on the grounds that it’s another way for government to try to control behavior. Is Ban on Plastic Stimulating Retail Market’s Early Doom?